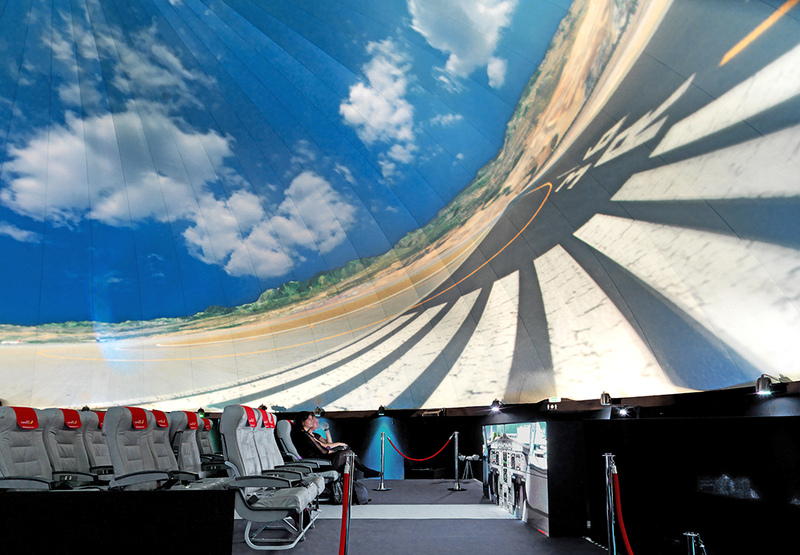 For the virtual 360 ° projection, Newmedia used a GEODESIC with 6 projectors Christie Roadster HD20K-J Dome, as well as a player Delta Media Server of 7thSense for processing the image, Medialon for managing the peripherals and a flat panel LCD FHD461-X to simulate the display of a boarding gate. Iberia Express held that it has reached the 10 million passengers over three years and that has been recognized by the industry with the award for the 'low cost most punctual in the world airline' organizing a virtual flight between Madrid and Tenerife. To perform this screening it used a 360-degree dome provided by live events specialist NewMedia Creative Technology Studio Y Christie. 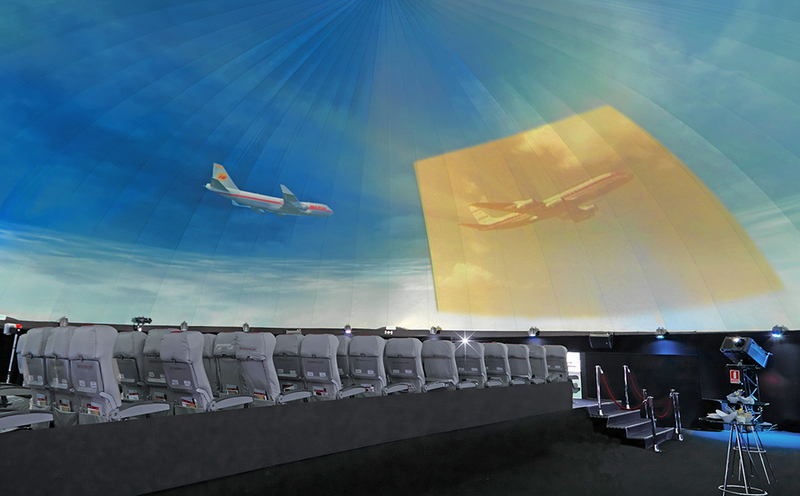 Become an authentic aircraft of Iberia Express, the dome of Newmedia was the scene of multiple sessions of free entry in which, on a journey through the history of aviation and the achievements of the company during these first three years for three days hundreds of passengers might embark on a virtual trip with destination to the island of Tenerife. "We wanted an event that would allow us to communicate these two milestones in an innovative manner technologically, since it is one of the points that define a part of our DNA and in which we work actively, always looking for products that make us Excel in that area" He says Paloma Utrera, responsible for sales of Iberia Express. The biggest challenge was to generate a realism that the audience could experience to being inside an aircraft and the sensation of flying. "We did a virtual simulation of a virtual reality system using Oculus Rift that we set to a certain point and, in this way, simulate what later it would be the platform or fuselage of the plane. Then, through the creation of a film in 360 ° real-time, we went by modifying or changing the midpoint of the film to test the feeling of the takeoff and landing, was undoubtedly the Achilles heel of this virtual tour. Once we saw that this was possible and took him to an Airbus A320 scale ", explains Anna Diego, CEO of Newmedia. 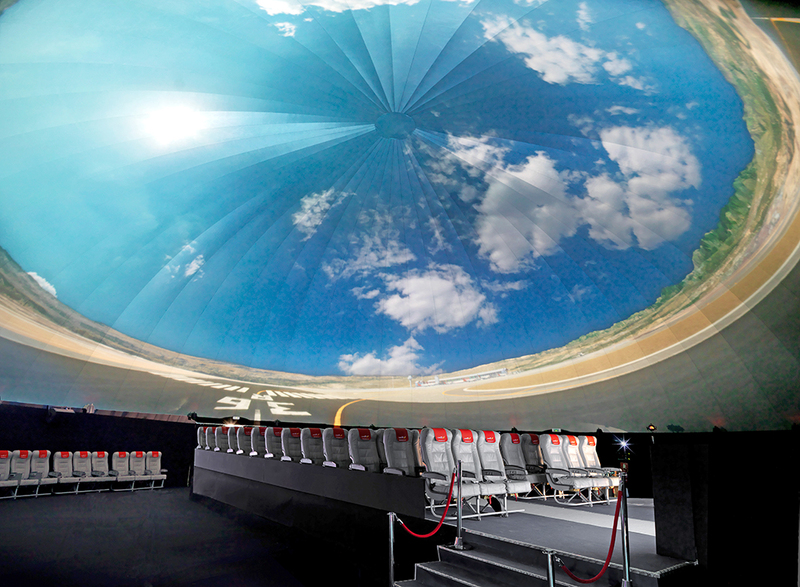 NewMedia used a geodesic dome with projection system internal negative pressure of 21.7 meters in diameter and 11 in height with a surface area of approximately of 364 square meters. In the interior of this structure is recreated real-size part of the fuselage of an Airbus A320, aircraft company logo. Mounted on a platform that had a vibration system by subwoofer, 90 actual seats donated by Iberia Express gave life to the plane. Guests were greeted as if they reach an airport and driven to the dome through a glass tunnel that pretended to be the fuselage of the Airbus. Once inside and accommodated in their seats, the staff of the unit was the usual safety precautions on all flights. Then, through a system of vibration in synchrony with the projection of images in 360 degrees, generated the sense among participants that the appliance was moving and taking off. Once in the 'air', after the classic greeting and signs of the flight captain, projected images of Tenerife, as well as an audiovisual production with the history and achievements of Iberia Express. And using a sophisticated handling of real and computer-generated images, the audience could recreate a situation of actual flight. 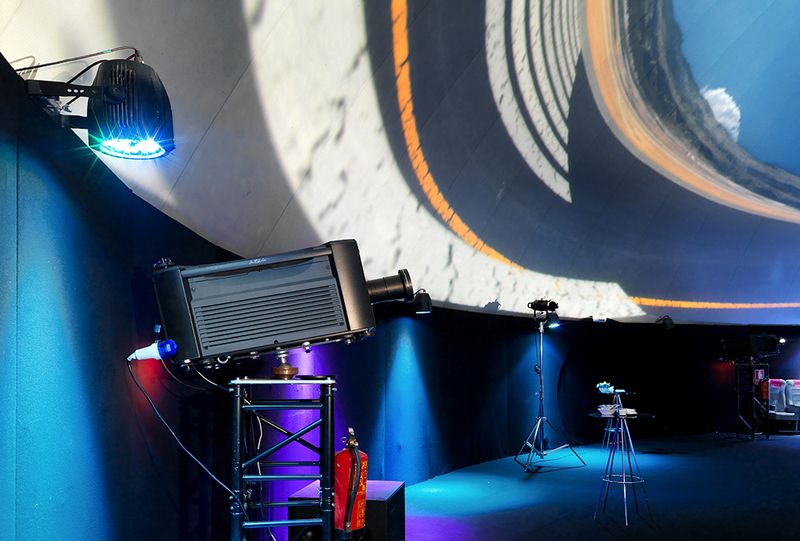 Six projectors Christie Roadster HD20K-J which was created the dome immersive environment, working at almost 3K resolution with more than 12 million pixels were used for the staging of this project. With five teams distributed symmetrically held base and ecuador projection, and with one-sixth the dome itself, allowing you to have a projection 360 ° x 180 °. Six projectors were located on truss structures to two meters tall and mounted on a hinge that specially designed by Newmedia and allowing to adjust between 0 ° / 65 ° the necessary angle. Delta Media Server player of 7thSense It is used for the processing of the image, which was TGA sequence uncompressed 4.4.4. It was also used Medialon as control system for governing peripherals and a flat panel LCD Christie FHD461-X was installed on the outside of the dome to simulate the display of a boarding gate pointing the time and destination of the flight. Using the blending and warping was key to fit the projection accurately on the irregular surface on which was projected. "In fact, this projection system is so complex that in some places they converge to more than four points of blending, four by blending in one spot and a curved surface," explains Anna Diego. "Both the blending and the warping perform them externally from our server Delta, but did so for the issue of the autoaligment and polar correction." The projection surface was of 800 square meters and 2 700 × 2, 700 pixels resolution, i.e., close to 3K. The projected contents included CGI sequences, images shot in 360 °, conventional videos in 4K and footage provided by Iberia Express.